We know that knowledge networks and intensive competition within cities boosts innovation. There are also further scales to this dynamic. The networks and competition between cities at regional and global scales promotes the adoption of new ideas- as cities buy, borrow and adapt ideas from their competitors. It’s this latter global dynamic that we’re exploring in this post, investigating the spread of new ideas in a sector that’s intrinsically urban in nature- public transport. After widespread decline in the second half of the 20th century, transit has recently undergone an impressive renaissance linked to the dramatic growth of urban populations, high density forms and sustainability policies. The spread of new ideas between cities is clustered in space and in time, as cities are strongly influenced by nearby competitors, as well as economic investment cycles. Therefore a natural way to visualise these spatial and temporal patterns is through animated cartography. This is the technique used here with the help of Processing and the MapThing library by Jon Reades (allows GIS data to be imported into Processing). London celebrated 150 years of the Underground this year, and it was three decades after 1863 before other cities in Europe and North America had their own high-frequency high-capacity city centre networks. This delay can be linked to varied levels of industrialisation between countries, as well as the time taken to improve the metro concept with electrical power (the original Underground amazingly used steam locomotives). It’s interesting that the youthful American metropolises of Chicago and Boston were quicker off the mark to build metro systems than many European capitals. Buenos Aires in 1913 and Tokyo in 1927 (now the world’s largest metro) were early exceptions to the European and North American monopoly on metro systems. Yet it took until the 1980’s onwards with the rise of Newly Industrialised Countries like Brazil, Russia, India, Mexico and Turkey for metro systems to become truly global. China is now in a league of its own with gigantic metros in Shanghai, Guangzhou, Beijing and Hong Kong. Initially BRT adoption is highly clustered in Brazil’s major cities, with a few early adopters including Santiago de Chile, Quito, Pittsburgh and Essen in Germany. Then in the late 1990’s the dynamic changes with a burst of new systems in Central America, Canada, Australia, and mainly second-tier cities in Europe. Taipei has spearheaded the adoption of BRT into China, with many new large systems emerging. Sizeable BRTs also recently opened in Istanbul, Tehran and interestingly in Lagos where hopefully further investment in African cities will follow. The original pioneer of bike sharing is not as clean cut as the BRT and Underground examples as there have been several generations of innovation (see pdf article). In 1995 Copenhagen successfully created a reasonably sized (1,000 bikes) coin operated system with specially designed bicycles that tried to reduce theft. A small number of cities in Germany and France followed suit. The next generation began in Lyon in 2005 with a larger (4,000 bikes) system using smart card technology that greatly reduced theft. Subsequently bike sharing has exploded globally across Europe, North America, China and South Korea. Paris has by far the largest system in Europe with 20,000 bikes. But even Paris’s Vélib’ is small compared to two huge Chinese systems in Wuhan (90,000 bikes) and Hangzhou (70,000 bikes). China’s strong cycling tradition has recently been in decline with rising car ownership, and hopefully the Bike Share boom will reverse this trend. So to conclude, we are experiencing an age of truly global transit adoption with innovations spreading more rapidly through global city networks. While innovation has traditionally arisen in Western European and North American contexts, by far the greatest urban growth is in Newly Industrialised Countries, increasing demand for innovations like BRT. The rapid rise of bike share systems shows that relatively modest innovations can have a global impact when the innovation is popular and effectively implemented. The ridership and scheme size data relates to current passenger levels rather than the size of the system at the time of construction. Would be great to do this visualisation with time-series ridership data, but this is not to my knowledge currently available. The definition of metro and BRT systems used here comes from the database providers, and there is some ambiguity, e.g. in defining when a regional urban rail system can be classed as a metro (see metrobits.org). Cities have always been the great spaces of commerce, trade and advertising; and recent decades have seen the corporate realm expand with the privatisation of services such as transport and utilities. Arguably corporate ownership is currently taking a new aspect with the explicit branding of urban places. English football clubs now play at the Emirates, Etihad and Sports Division Arena, rather than at Highbury, City of Manchester and St James’s Park stadiums. Skyscrapers in Canary Wharf project gigantic banking logos across East London. Westfield super-malls have branded entire new urban districts of streets and squares. This process is not new- corporations have been building places to express their brands for a long time. Disneyland is perhaps the most famous example, and arguably the original UK new towns like Cadbury’s Bournville shared some of the same ideals. Many useful projects would simply not happen without corporate sponsorship, such as the popular (but loss-making) Barclays Cycle Hire scheme in London, soon to be mimicked with Citi-Bike in New York. The question however is whether this process represents a ‘slippery slope’ towards a comprehensive corporate branding of urban space. There has been much recent debate in London over the mayor’s decision to develop a cable car project across the Thames at the O2 Arena (another corporate venue). The project is sponsored by Emirates airlines and their name will be attached to two public transport stations, including appearing on London’s classic public transport map for a period of ten years. The impact is fairly minor, though it does mean London is now in the dubious company of Dubai and Las Vegas in allowing sponsorship of subway stations. It did get me thinking, what would happen if London let rip and allowed the full sponsorship of the public transport network? My guess at the resulting network for London of businesses naming districts where they locate is below. Obviously this map is satirical and would never actually be allowed to happen. I would argue though that this map does in its own way represent a real geography of corporations and capital flows in London. 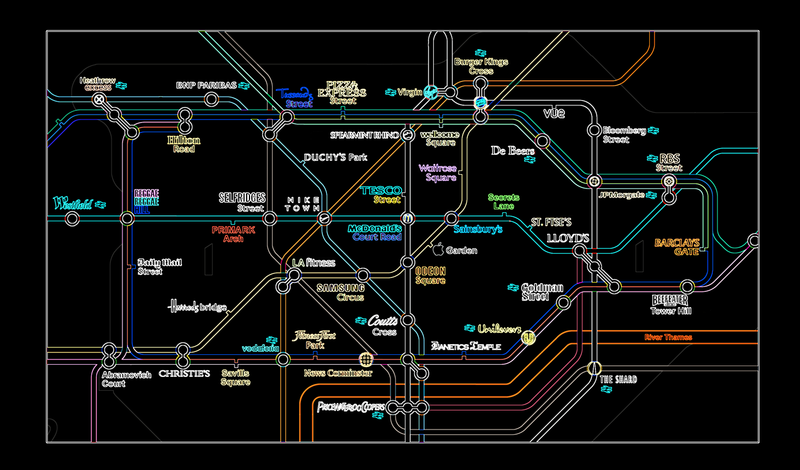 Is this map a more functionally honest representation of contemporary London than traditional images?